Annie and I both spent about three months travelling around Australia. I did not see anything of Western Australia unfortunately but we both visited many other places ‘together’. From Darwin I travelled through the red centre, time in Alice was very special, something Annie missed, and from there I took the Ghan to Adelaide. Annie, on the ‘Sunbeam’ had travelled round the coast from Western Australia along the South of the country, also visiting Adelaide. We both spent time in Melbourne before heading north to Sydney. Thus for the context of this week of ‘In Conversation with Annie’ and the collection at Bexhill Museum, I am connecting with the Southern part of Australia rather than individual cities. I would run out of time and the classification of objects does not allow for such detail in their origin. 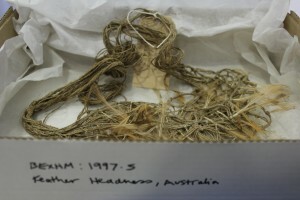 My treat in revisiting Southern Australia in the context of the archives is a feather headdress. 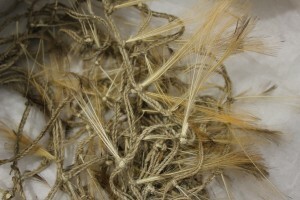 Made of parrot feathers and vegetable fibre it is the most exquisite and delicate piece I have worked with. Tangled on itself and without possibility of unravelling, for fear of damage, it remains enigmatic and the stories concealed within. Considered by the Uniques Project (uncovering Ethnography in Kent and Sussex) it had been scrutinised by experts without giving an inch. It remained elusive and a ‘mystery object’ returned to its tissue and box for safe keeping. Recent contacts made at Sydney University, however, may be encouraging in learning more. The enjoyment of following the lines on the paper and the frustration at the delicacy of the feathers in my clumsy pencil drawings kept me utterly absorbed. 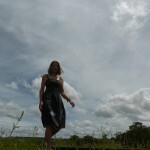 Photographs are again left wanting, flutters in my breath are fleeting and fragile. Barely there, the stillness in the image is deceptive. 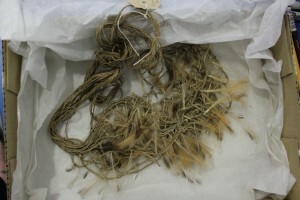 It took all my will power (and a watchful Curator) not to try and unravel, but to absorb and imagine. To accept its secrets. 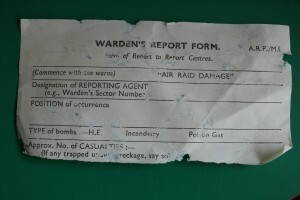 The story within remains, but the connection with the Museum and its site is evidenced with the label written on the back of an Air Raid Warden Report Form. The Museum opened in 1914, the start of the First World War. 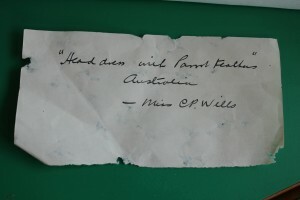 The context of object, place and person is captured in this small piece of paper. This entry was posted in Artist in Residence, In conversation with Annie on May 18, 2015 by Louise Kenward.